Warnings on write-offs, outstanding finance and theft on used car checks are continuing to rise. 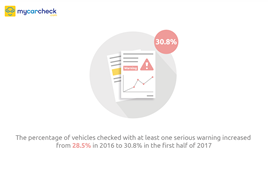 New data from used vehicle checker Mycarcheck.com has revealed that serious warnings have risen again to 30.8% of all checks in the first six months of 2017. This follows an increase from 25.6% in 2015 to 28.5% in 2016. Mark Bailey, head of CDL Vehicle Information Systems, which owns Mycarcheck.com, said: “These new figures show the risks associated with the UK’s most popular used vehicles and why it is so important to check before you buy. With information from the police, DVLA, insurers and finance houses, Mycarcheck.com holds data on every vehicle on UK roads.